Here it is, guys!! 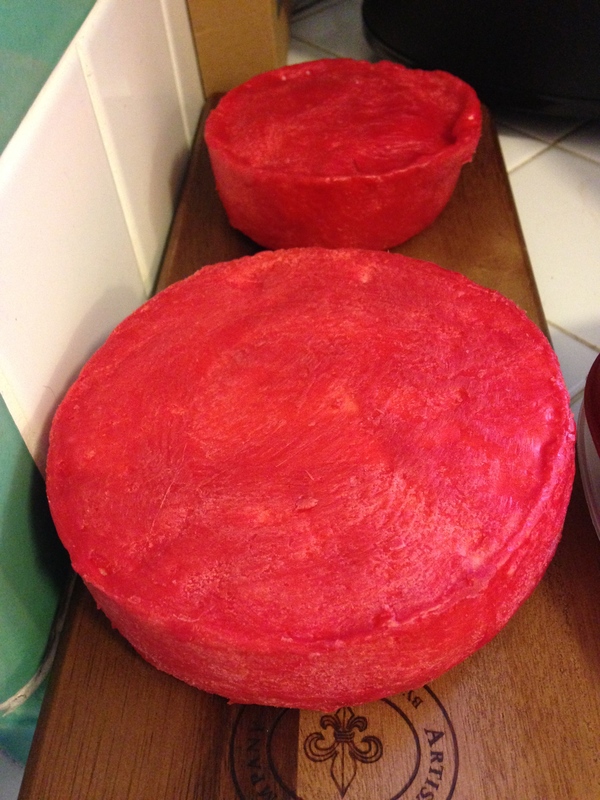 I just waxed my cheddar cheese, and I will be eating delicious cheddar in a mere four weeks. Hopefully its delicious. After all this work, though, I’m eating it even if its foul. The cheese will be eaten, damn it. And I bought a beautiful acacia (sustainable) wooden board for my future cheesy products. In other news, I made GREEK YOGURT yesterday! Now, this was a little challenging in some ways, but ridiculously simple, why-would-I-ever-pay-for-this-again easy. First, you go to Cultures for Health, this fabulous company that mails you all the yeast, bacteria, and other odd organisms your little heart could desire. They have your mesophilic starters, your thermophilic starters, your yogurt bacteria, your greek yogurt bacteria, your kefir grains, your sourdough starters, your rye starters…and the list goes on and includes some things that I’m like (????) about. Then, you heat 1 quart of milk to 160 degrees. Allow the milk to cool to 110 degrees. This is the exact temperature that your thermophilic bacteria just loooooove. They go crazy for 110 degrees! Dump the starter in the milk, and incubate for (according to them) 5-10 hours or (according to me) almost 12 hours. This is the tricky part. You need something that will hold a steady temperature of 110 degrees for this long. – an oven that is extremely patient with you. Mine did auto shutoff at 12 hours, so its a good thing that my yogurt was done. When your yogurt is done, it will stay as a solid mass when you tip the jar gently. When it is done, pop it in the fridge to halt fermentation and then chow down the next morning. Here’s the coolest part: you use your OLD yogurt to make your NEW yogurt. You take three tablespoons from the previous batch in a new batch of heated milk and BAM. Yogurt. For. Ever. Hope your cheddar turns out well (I made one recently that was pretty foul but then I’m new to all this!) Look forward to checking back for updates. Thank you for the good cheddar wishes! I hope it turns out well, but it seems that unlike you, all I have to please is myself and my boyfriend (who will enthusiastically eat anything that is not nailed down), so hopefully it is acceptable at least to us. I will be sure to post an update when it is first consumed!